Pick from a selection of hotels in the 5th, 6th, and eastern 7th arrondissements, with an emphasis on locations near the Seine. 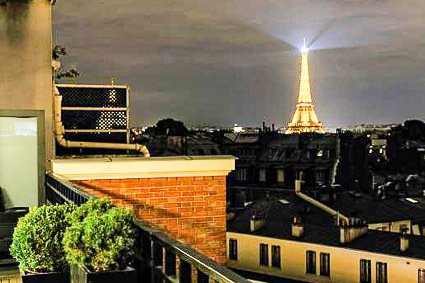 ABOVE: Some rooms at the five-star Hotel Pont Royal have terraces with views of the Eiffel Tower. The term "Left Bank" conjures up images of painters and philosophers, literary cafés, and lovers kissing to accordion music. The reality is a bit different these days: The arrondissements along the southern bank of the Seine are mostly upmarket, and lovers are outnumbered by commuters catching buses along avenues that are filled with cars. Head inland, and the ambiance is even more remote from the Left Bank of vintage Hollywood movies, although many of the neighborhoods are certainly pleasant to live in. Still, the Left Bank has its advantages as a place to stay: Many tourist sites and sights are on the Rive Gauche, Métro and RER lines will take you just about anywhere in the city and its suburbs, and most smaller streets close to the river still contain a whiff of the magic that made Paris a magnet for artists, writers, and bohemian tourists a century ago. They're reasonably near the Seine (and therefore within walking distance of the Right Bank). Not all Paris hotels are air-conditioned, especially in the one-, two-, and three-star categories. If you're visiting in the summer and don't like heat, check whether a hotel has air conditioning before you book. The hotel listings on the following pages have guest-rating scores that are drawn in real time from Booking.com's database. If you're on a slow or metered connection, you can save bandwidth by viewing the faster-loading mobile version of this article, which lacks the scores.